SEIU organizer Brandon Nessen talks with a Crystal Care worker seeking unpaid wages from the company. 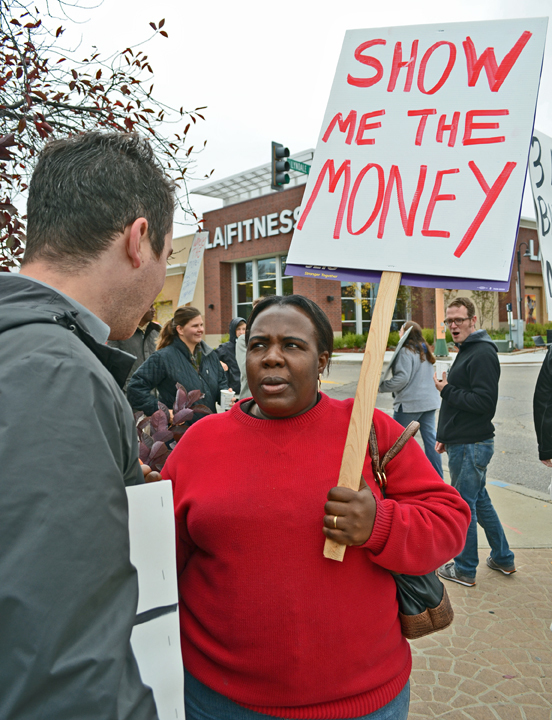 The union working to organize home-care workers statewide is lending its support to employees who accuse Richfield-based Crystal Care Home Health of failing to pay their wages. Some claim they worked up to three months for the company without pay. SEIU Healthcare Minnesota helped organize a picket Wednesday morning outside Crystal Care, and more than a dozen workers, including nurses, personal-care attendants and home-health aides, demanded the company pay them the wages they’re owed and stand accountable for state funding the company received. Crystal Care, which received more than $20 million in state reimbursements over the last three years, filed for Chapter 11 bankruptcy Sept. 16. The company continues to pay a reduced staff. That hearing is scheduled to take place Oct. 28 at the federal courthouse in Minneapolis. With the support of SEIU Healthcare Minnesota, workers have requested documents from Crystal Care that would ensure their claims for unpaid wages come before the bankruptcy court. Nessen said the local union learned what was happening at Crystal Care in the course of organizing home-care workers for a statewide union election. The trouble at Crystal Care, he added, shines light on a complex labyrinth of funding streams for home health care, one in which workers’ concerns sometimes get lost in the shuffle. There is strength in numbers, Ilgen added, urging other Crystal Care workers who believe they are owed unpaid wages to join the fight by calling Nessen at 651-236-0919. “We’re not going to stop fighting until we get our money,” she said.